Alopecia areata is a common autoimmune skin disease, causing hair loss on the scalp, face and sometimes on other areas of the body. In fact, it affects as many as 6.8 million people in the U.S. with a lifetime risk of 2.1%. People of all ages, both sexes and all ethnic groups can develop alopecia areata. It often first appears during childhood and can be different for everyone who has it. Will I have hairloss for life? Alopecia areata is known as a “polygenic disease.” This means that, unlike a single-gene disease, both parents must contribute a number of specific genes in order for a child to develop it. Because of this, most parents will not pass alopecia areata along to their children. With identical twins — who share all of the same genes — there’s only a 55% chance that if one has alopecia areata, the other will, too. This is why scientists believe that it takes more than just genetics to cause the disease and that other environmental factors also contribute to people developing alopecia areata. Are there different types of alopecia areata? With all forms of alopecia areata, your body’s own immune system attacks your healthy hair follicles, causing them to become much smaller and drastically slow down production to the point that hair growth may stop. Depending on which type and severity of the disease you have, you might experience hair loss in different areas and your hair loss and regrowth may be unpredictable and cyclical (happen over and over) for many years. Though for some people, hair may also regrow in a few months. Currently, there is no cure for alopecia areata. But the good news is that even when your disease is “active,” your hair follicles remain alive. This means that your hair can grow back again — even after a long period of time and even if you have more than 50% hair loss. Learn more about all of the different types of alopecia areata. There are lots of factors that contribute to developing this complex condition. Alopecia areata is an autoimmune disease, which means your immune system mistakes the normal cells in your body as foreign invaders and attacks these cells. Scientists aren’t exactly sure what “triggers” the immune system to attack healthy hair follicles when people have alopecia areata, or even if these triggers first happen inside the body (from a virus or bacteria), outside the body (from something in your surroundings) or if it’s a combination of both. Will my child inherit alopecia areata from me? It’s understandable that adults who have alopecia areata would be concerned about the risks of passing the disease to future children. However, because alopecia areata is so complex, it’s almost impossible to predict whether or not your child will develop the condition. Scientists believe that multiple factors (both genetic and in the environment) are needed in order to trigger the disease, not just simply family heredity. In fact, most parents will not pass alopecia areata along to their children. Did you know as many as 6.8 million people in the U.S. — 147 million people worldwide — are affected by alopecia areata with a lifetime risk of 2.1%? What kinds of symptoms will I have with alopecia areata? All types of alopecia areata result in some form of hair loss. There is no way to predict the pattern of hair loss and regrowth you will experience or how severe or long lasting it will be. 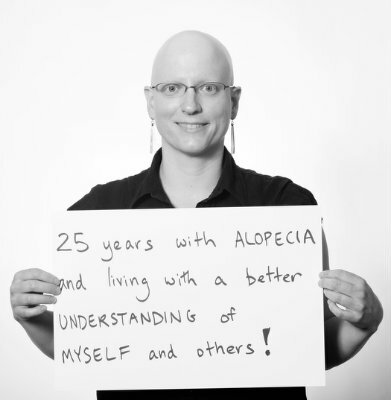 It’s important to remember that alopecia areata is different for everyone who has it. Still, there are some common symptoms of alopecia areata that are good to know and recognize. However, the only way to be sure you have alopecia areata is to make an appointment and get a diagnosis from a doctor. What are my options for treatment and care of affected areas? Unlike many skin diseases, alopecia areata does not cause rashes, redness, hives or severe itching. Even so, some people with alopecia areata find it helpful to protect exposed skin — the head, ears and face — from damaging sun exposure or other harsh elements. A scalp without hair is more sensitive to cold as well. Depending on which type of alopecia areata you or your child has, your age, and the extent of hair loss, there are a variety of treatment options available for disrupting or distracting the immune attack and/or stimulating the hair follicle — especially for those who have milder forms of the disease (less than 50% hair loss). For those who have more than 50% hair loss on their scalp or other areas of the body, there are oral and injectable medications available. However, these medications do not work for everyone. That’s why it’s important to talk with your doctor to discuss the risks and benefits of using any medications. Learn more about treatment options and products and accessories for people with alopecia areata.